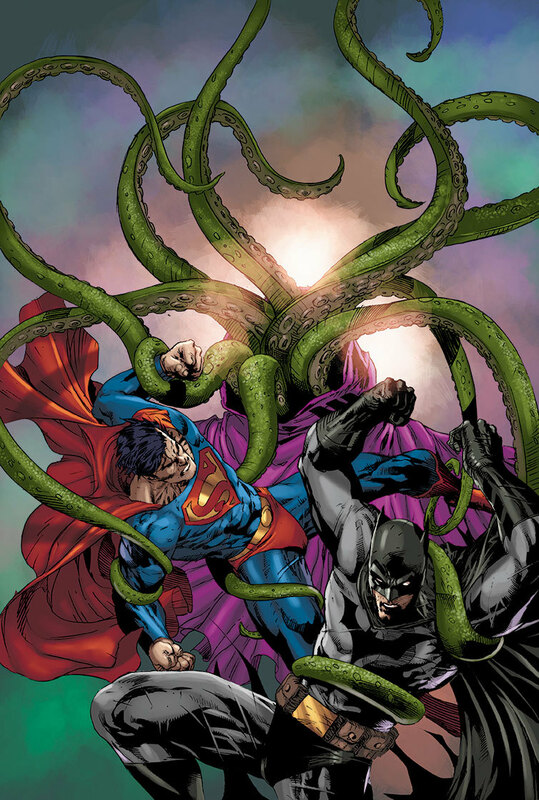 Superman vs Cthulhu: Super Heroes and Cosmic Horror – I.E. A new project has me thinking about how Super Heroes and Cosmic Horror interact with one another. At first blush, these two genres would seem to be mutually exclusive. Super Heroes are ultimately symbols of optimism. Their stories are generally about normal people who, when granted powers far greater than those of their peers, seek to bring justice and peace rather than bring war or ruin. Some modern interpretations disagree, of course, but these kinds of deconstructionist views act as the exceptions that prove the rule: you would not have an Authority, for example, without Superman and Batman engaged in the neverending battles and crusades. On the other side of the genre coin, you have the kind of existential horror exemplified by the work of H.P. Lovecraft and his many collaborators and imitators. Here, heroism is, at best, a naive notion that is quickly dispelled by despair and madness. In cosmic horror, there is no justice or peace, and even war and ruin don’t matter, for the real terror comes not from the amorphous things living just outside of our vision, but from the unfeeling and uncaring universe. Everything is sliding toward entropy and nothingness. Even the monsters are doomed. It is the ultimate expression of pessimism and nihilism. So how do we bring these two genres together? And, more importantly, why? What can we hope to create from mixing these reagents, and how do we avoid blowing ourselves up in the process? Is that a deep one? 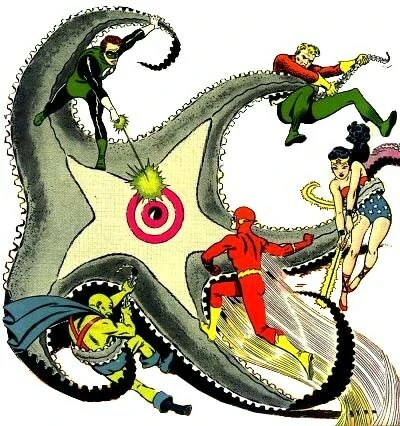 Comic book super heroes and undulating weird horrors have cross paths many time before, of course. super heroes emerged out of the same primordial pre-pulp fiction as did Lovecraft’s work, who was inspired by Edgar Rice Burroughs and Algernon Blackwood. The violent, criminal yet essentially “good” masked heroes of the pulp era gave rise to the earliest Super Heroes (the Man of Steel owed much to the Man of Bronze, and Bat-Man was heavily inspired by The Shadow). The pulps were waning just as comics started to rise, but many of the young men (and a few women) creating those early costumed heroes had cut their genre teeth on pulp magazines like Weird Tales. 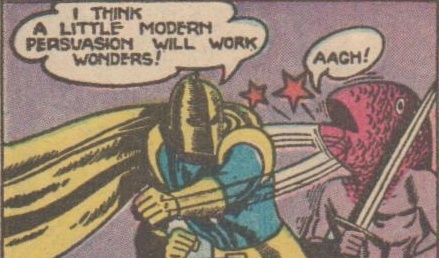 Characters like Dr Fate and The Specter appeared very early on and considered great cosmic powers and elements of horror in their stories. Super hero stories have always mined horror for villains and plots, embracing whatever monstrosities sit atop the cultural consciousness. Vampires and werewolves have always been popular, usually inspired by the Universal movie versions of those creatures, and there are a number of Frankenstein’s monster analogs and even outright uses. Zombies, the current favorite of pop culture horror, are everywhere and have devoured both the Marvel and DC universes within the last few years. And there are many comics and heroes that site squarely in a place of horror, from Marvel’s Blade and Morbius the Living Vampire to Todd MacFarlane’s Spawn to DC’s Swamp Things and more recently Justice League Dark. From the Official Dark Horse Hellboy website. One book in particular, though, really embraces the Lovecraftian side of horror (mixed with just everything else as well). Mike Mignola’s Hellboy — the titular character is a demon, but also a super hero — is a horror comic that does super heroics, or a super hero comic that does horror. In either case, it represents probably the most perfect marriage between the genres, and Mignola’s evocative art and tight scripting do not hurt. 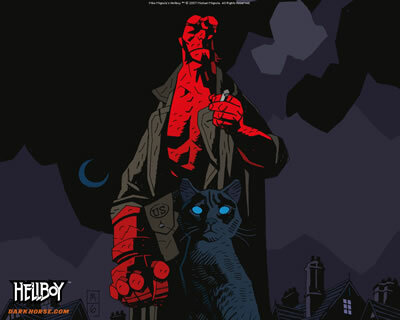 However, as good as Hellboy is at mixing these oil-and-water genres, in doing so it pulls the Hellboy character out of the lofty clouds of primary colors, capes and cowls and grounds him with the guns and the ever-present gritty cape analogue of the trench coat. So while we can use Hellboy as a way to start thinking about Super Heroes versus Cosmic Horror, it is just a point of beginning (but a damn entertaining one). What would Superman do in the face of Cthulhu? How would Batman react upon discovering the Shadow Over Innsmouth? Could Captain America maintain his sanity when confronted by vast uncaring cosmos via the Color Out of Space? Although the trappings vary, all super heroes essentially punch things for justice: they use direct intervention against enemies that can be beaten, captured and otherwise negated. In short, super heroes can win. By definition, the terrors of cosmic horror cannot be beaten — their victory is inevitable and the only succor against that knowledge is to retreat into madness. This seems at first to be an insurmountable problem in marrying the genres. What I think allows the super hero to continue to not only exist but to operate and even succeed after a fashion in the context of cosmic horror is their inherent optimism. Super heroes fact insurmountable odds daily — or at least monthly. A meteor rocketing toward the Earth, a virus transforming people into mindless drones, an army of hyper intelligent gorillas invading from two universes over, these are all familiar threats to the super hero, and they all threaten the very existence of mankind. Yet, the super hero soldiers on and preservers. The only difference between those typical comic book threats and the threat posed by cosmic horror is that the latter cannot be overcome. But that is knowledge reserved for the audience. As far as the super hero is concerned, that elder thing spreadings its dark influence throughout the world and threatening to wake is just another villain to be defeated. That heroic optimism provides the hero with not only the will to face these eldritch horrors, but also at least a modicum of protection against the mind rending, soul shattering truths at the heart of cosmic horror: that we are insignificant in the fact of the enormity of time and space and that we are no more than insects to the vast and incalculable minds of the monstrosities that exist in the dark between the stars. Moreover, even for the hero that has accepted the inevitability of the ultimate end, the true motivation of most super heroes remains: protect the innocent. In this case, it means saving potential sacrifices from cultists who would hasten the rise of the elder thing, destroying the weird alien creatures that wander aimlessly into our reality, and, occasionally, push back the timeline of that waking just a little longer. It may also mean something else, often outside the usual purview of the super hero: protecting people by hiding the truth from them, sparing them the madness that invariably comes with recognizing the futility of it all. As different as the genres seem, I think the combination of super heroes and cosmic horror provides a lot of potentially compelling stories, without needing to tarnish or deconstruct the heroes or water down the existential threat of the cosmic horror. This entry was posted in Horror, Random Ideas, Super Hero, Writing and tagged Batman, cosmic horror, Dr Fate, Hellboy, Lovecraft, pulps, Starro, Superhero, Superman. Bookmark the permalink. If you look at the pulps, this conflict of world views was being explored by some writers. Robert E. Howard’s sword & sorcery heroes came out of such a mix. C. L. Moore’s Jirel of Joiry and North West Smith further develop the blending of the heroic optimistic with the existential cosmic horror very effectively. Moore’s template is very significant because it emphasizes the emotions and offers an almost symbolic psychological interpretation of the intrusion of the alien chaotic reality into an ordered rational one. The Occult Detective,Jules de Grandin, created by Seabury Quinn offers another early template of the heroic figure confronting such forces. I am a lover of Weird a Tales era stories and have read much Howard and Moore. I am less familiar with the other author you mentioned. I’ll have to see if I can find any! Pingback: Strange Arcana: The Stars are Right | I.E.